This image does not show any stars because the Herschel Space Observatory’s cameras record far-infrared light instead of visible light. Gas is not visible either, even though it makes up most of the 400,000 solar masses of matter in this cloud: dust amounts to only about one percent of the mass. The side of this image spans about two degrees, or four times the diameter of the moon. At the cloud’s distance of 6,500 light years, this corresponds to about 230 light years. North is up and East is to the left. This three-color image of W3 uses visible colors to depict far-infrared radiation of different wavelengths, combining the Herschel bands at 70 μm (depicted in blue), 160 μm (depicted in green) and 250 μm (depicted in red). Hotter structures emit more strongly at shorter wavelengths. Red represents very cold shielded dust structures with equilibrium temperature about 10 degrees Kelvin (10 degrees above absolute zero, or -263 degrees Celsius), while blue is somewhat warmer at around 30 degrees Kelvin, with yellow in between. Compared to the right side of the cloud which is cold and red, the left side glows yellow, because it is heated by the radiation coming from high-mass hot stars off to the left, just outside the field of view of the image. While different colors correspond to different temperatures, brightness records the quantity of dust. Before Herschel’s two cutting-edge cameras, such a precise determination of the temperature and quantity of dust has been impossible. This capability, combined with the high resolution of Herschel, is exploited by the HOBYS Key Program to study the early stages of formation of stars more than ten times as massive as the Sun. 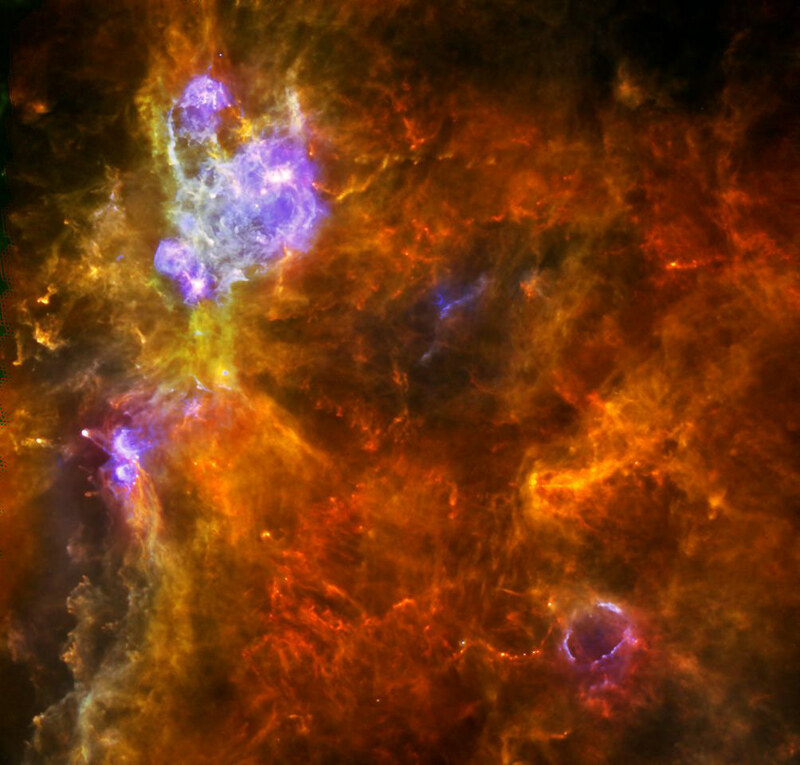 In a new study, scientists use Herschel data to view a giant cloud of gas and dust called Westerhout 3 and to study the early stages of high-mass star formation, finding that baby stars may grow to great mass if they happen to be born within a corral of older stars. Newswise — Stars ten times as massive as the Sun, or more, should not exist: as they grow, they tend to push away the gas they feed on, starving their own growth. Scientists have been struggling to figure out how some stars overcome this hurdle. Now, a group of researchers led by two astronomers at the University of Toronto suggests that baby stars may grow to great mass if they happen to be born within a corral of older stars –with these surrounding stars favorably arranged to confine and thus feed gas to the younger ones in their midst. The astronomers have seen hints of this collective feeding, or technically “convergent constructive feedback,” in a giant cloud of gas and dust called Westerhout 3 (W3), located 6,500 light years from us. Their results are published in The Astrophysical Journal. “This observation may lift the veil on the formation of the most massive stars which remains, so far, poorly understood,” says Alana Rivera-Ingraham, who led the study while she was a graduate student in the Department of Astronomy and Astrophysics at the University of Toronto, Canada, and is currently a postdoctoral researcher at the Institut de Recherche en Astrophysique et Planétologie in Toulouse, France. To study the formation of high-mass stars, Rivera-Ingraham and collaborators used high-quality and high-resolution far-infrared images from a space telescope launched by the European Space Agency in 2009 —the Herschel Space Observatory. This telescope’s two cameras recorded light that is not visible to the naked eye, spanning a range from infrared radiation partway to the microwave region. Exploiting these cameras, scientists including Peter Martin, Professor in the Canadian Institute for Theoretical Astrophysics at the University of Toronto, created the HOBYS Key Program to study the birth of very massive stars in nearby giant clouds of gas and dust in our own Galaxy, including W3. Research on HOBYS at the University of Toronto is supported in part by the Canadian Space Agency and the Natural Sciences and Engineering Research Council of Canada. Stars are born in the denser parts of gas clouds, where the gas gets compressed enough by gravity to trigger nuclear fusion. The more massive the newborn star, the more visible and ultraviolet light it emits, heating up its surroundings —including the dust studied by Herschel. “The radiation during the birth of high-mass stars is so intense that it tends to destroy and push away the material from which they need to feed for further growth,” says Rivera-Ingraham. Scientists have modeled this process and found that stars about eight times the mass of our Sun would stop growing because they run out of gas. But astronomers do see stars that are more massive than this theoretical limit. And by looking at W3, Rivera-Ingraham and her collaborators have found clues to how this might be possible. Like young high-mass stars, older stars also radiate and push gas away. If such older stars happen to be arranged favorably around a major reservoir of gas, they can compress it enough to ignite new stars. The process is similar to the way a group of street cleaners armed with leaf blowers can stack leaves in a pile —by pushing from all sides at the same time. This corralling of dense gas can give birth to new, high-mass stars. A large newborn star will push its food source away, but if it is surrounded by enough large stars, these can keep nudging gas back at it. With such collective feeding at play, the young star could grow very massive indeed. Next on the to-do list of the astronomers is to test their idea by simulating the situation with computer modeling, by measuring gas motions, and by comparing their results with data from other giant clouds studied by HOBYS. Only then will they be able to discern the mechanism —collective feeding or not— that gives rise to high-mass stars in these giant clouds. 1 Comment on "Herschel Data Reveals Clues About High-Mass Star Formation"
Only problem with this great theory, is it debunks the theory of the earliest, largest stars in the history of the early universe, as there were no older stars to ‘feed’ them.